The work I do in my job demands me to do a lot of research because it is not exactly released to what I had been doing in Japan. I had a write an application in Free Pascal using Lazarus IDE and now I am doing development of web application using ReactJS. These are RAD projects so it is not feasible to take a long time and read up on these things in a book. So I use my laptop at work, tethered via the Galaxy S7 (previously the Nexus 5) and everything is great. Except, sometimes something eats up several hundred megabytes of my data! Initially, it was the Windows Update that was doing this. I was on the Fast level of Windows Insider program (the MacBook Air is my test PC) and it downloaded almost a gigabyte of data without me knowing. After I became aware of it, I checked the “Defer Updates” option in Windows Update. But then I found out you could specify a hotspot as a Metered one, so that Windows would download updates when connected via it. But still, there are other applications that I have installed in the PC that ignore this. And this was no different in OSX as well. They would go about downloading their updates freely. So I wanted to know if there was a better way to restrict the data usage. It didn’t take too long for me to find a problem with my new handset. At work, I was getting marginal 4G strength (like 1 bar and it sometimes dropped to zero bars) and the browsing speed was terrible. It would take seconds to load a simple website like Google.com. But when the signal strength drops below some set threshold, it would automatically switch to 3G as it should (I think the data is HSPA+ as it shows an H near the clock) and the speeds returned to being very good. I’m only talking about browsing speeds here, not SpeedTest speeds. Getting lower 4G speeds than 3G speeds is a messed up situation to begin with. The Galaxy S7 wasn’t helping to make the situation any better either. I wish I could override this fallback threshold, but it is not possible. 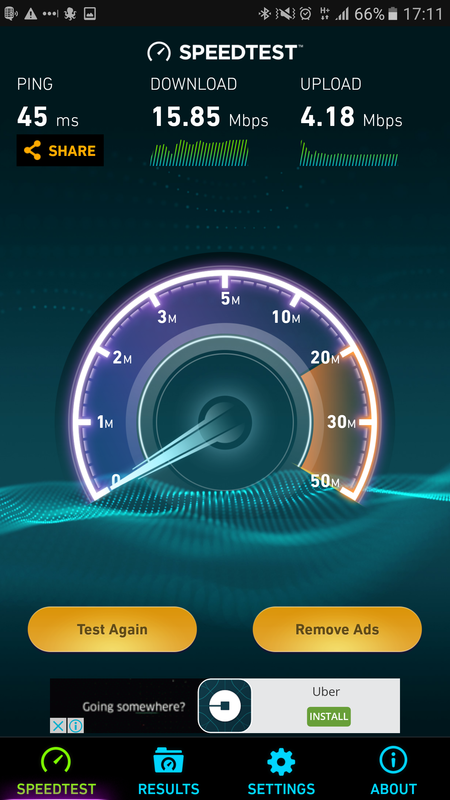 The only way to get good speeds was to manually limit Network mode to 3G from the Settings app. Once that’s done, it works pretty well. But I lose features like VoLTE because of this. Whether or not it is a useful feature is yet to be seen, but it is a feature the network and the phone support, so I would like to make use of it. 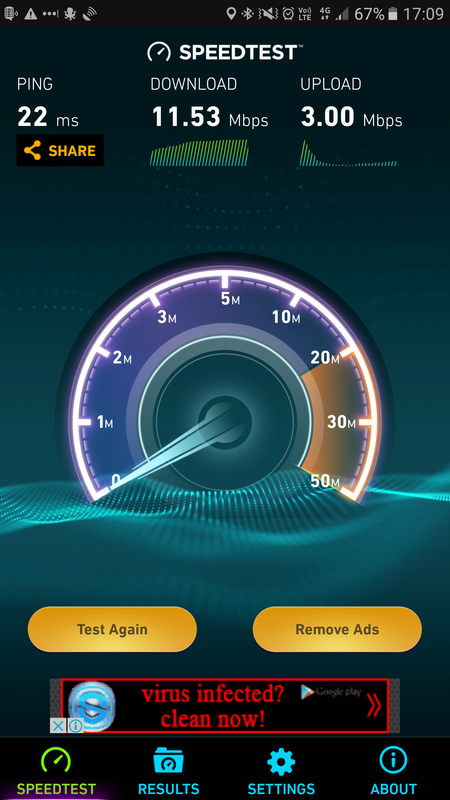 Near the office, these are my LTE and 3G Speedtest results. The S7’s software has some location based automation capabilities built in, but it does not let me switch the Network mode. That’s a shame, otherwise I could do this automatically based on my location. This was a non-issue with the Nexus 5 because I have never seen it operating in 4G mode at work. Either the radio transmitters aren’t good or that fallback threshold is higher than what’s set in the S7. Either way, I still got good speed with the Nexus 5. Good speeds in the sense, there was no perceptible lag. I went with the Galaxy S7 Onyx Black model. This is the Exynos model. This is my second Android phone, after the Nexus 5. Many would say that it was a stupid decision to buy it at this time because many new phones are coming in the next couple of months, such as the iPhone 7, Galaxy Note 7 and a new Nexus. But Optus, which is the network I was previously on, started offering the phone for $65 per month on a 2-year contract with unlimited calls and 7GB monthly data, so I had to grab it. It's still not as good as the Woolworths Mobile offer of $70 per month for the S7 Edge with 8GB data. But with the Optus offer, I didn't have to pay the early termination fee. I've had the Optus connection for only 4 months and I had to pay about $180 to terminate the connection. I was already paying $40 for it and that was without a phone. So the phone would only cost $25 a month excess and it would make phone only $600 over the 24 month period. The cheapest S7 costs almost $1000 locally, so that’s about $400saved. The only caveat is now I have only 7GB of data instead of 10GB. The $40 SIM only plan I had was in fact the $60 plan with 10GB monthly data, but I got it when it went on offer with a $20 monthly discount. The other advantage of sticking with Optus is that I can swap the handset after 12 months paying only $99. I don’t know if I would actually do it, but that is a good option to have because in a year we might have way better phones. Additionally, I can terminate this connection anytime without paying the early termination fees. I do have to pay the remaining value of the phone though, which is calculated at $45 per instalment (not $25 sadly, so it is not really worth doing that). I could have bought the phone online which is the preferred method generally, but it would have taken 2-3 days to arrive. Since I went to work yesterday by car, I decided to pay a visit to the Optus store in the Chadstone Shopping Centre on the way back to see if the deal was available in-store. I chatted with an Optus agent online to check if this was the case, but they were unable to confirm it. Luckily for me, they had the same offer in-store, so it wasn't an online only deal unlike some of the deals.